Oil and water just don’t mix. Some 30,000-ton of oil poured into the Mediterranean a month ago, after Israeli warplanes hit the oil-fuelled power plant of Jiyyeh situated on the coast, south of Beirut. One of the tanks burnt for days, sending thick black smoke across the country. The marine environment, including the endangered green turtle, will suffer tremendously for years. Laid eggs on beaches usually start to hatch in late summer (in a week from now). Baby turtles need to reach deep waters as fast as possible. 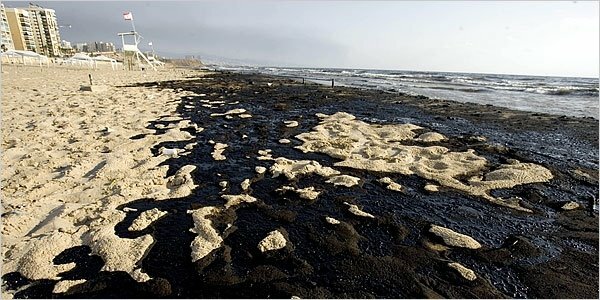 With the oil slick in their way, they will have no chance of making it. 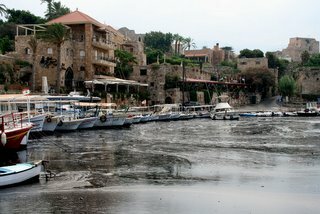 Other impacts include air pollution and chemical spills due to the targeting of industrial factories, fuel bunkers, and other flammable structures; the use of depleted uranium in Israeli bombs, and the huge waste and sanitary crisis resulting from the 750,000 refugees, which can lead to water pollution and the spread of diseases. Facts: Cancer cases are expected to rise significantly. The oil spill has hit more than 120 kilometers of the Lebanese coast. 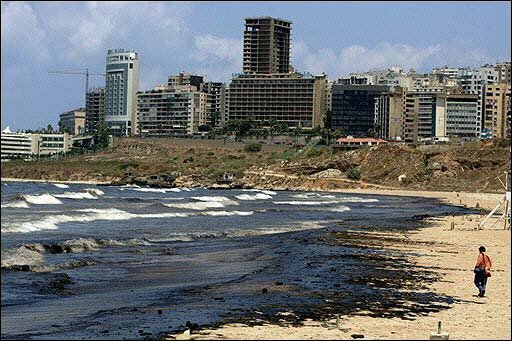 Thousands of oil- smeared dead turtles, fish and prawns have already been washed up on the shore. The Al Shouf Cedar Natural Reserve that shelters some of the few remaining century old majestic cedars was bombed three times since the beginning of the conflict. An estimated $30 million to $50 million is needed to clean up the shorelines. 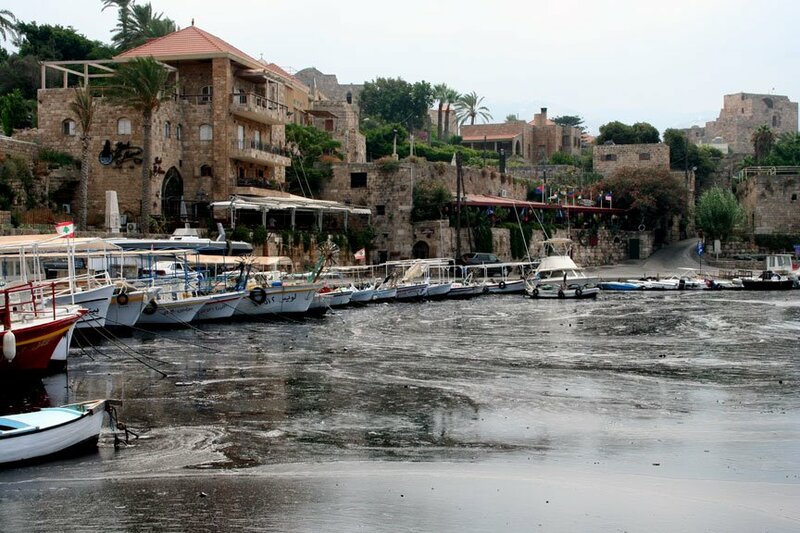 Optimistic assessments suggest it will take at least six months for the shore cleanup and up to 10 years for the reestablishment of the ecosystem of the eastern Mediterranean. The longer the oil spill is allowed to go unchecked, the greater the irreversible damage. One of the reasons I moved back here is because of the weather. I love UAE weather. I don't mind the heat and humidity. I'd rather that than -25 degrees temperatures. And I am one of those year-round beach-goers. I don't understand people who say "it's too damn hot" in the summer, and "it's too chilly" in the winter. Actually, December/January is really the best time to go to the beach. What more could you ask for: sun, sand, and a chilly but gorgeous sea (the secret is to simply jump in as fast as you can!). When I lived in Canada, I'd look forward to coming back to the UAE just to get a tan...especially in December when I'd be as white as an aspirin pill. A few days of sun and beach later, I'd get a nice, dark tan. I feel so much better when I am tanned: my clothes look better, my make-up looks better, I feel more energized....it's a great feeling. I just wish I could stay tanned, without having to work so hard at staying tanned! I've neglected my tan lately, what with travelling and working and sheer laziness. And I knew I was in trouble when my ex-blonde-usually-white-never-gets-tanned-sister came back from Greece looking 10 shades darker than me. Now that's just wrong! Gotta get working on that tan! I know I promised more London pictures but I have been extremely busy at work lately (day off on Monday? what day off? ), and not in the mood to blog for some reason. 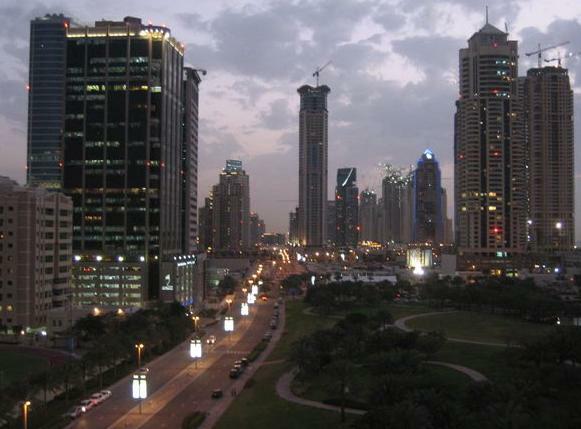 I am going through a sort of existential crisis phase lately: why am I here in Dubai? what's my life all about? am I letting work take over my life? do I even have a life? how long will I keep doing this for? do I see myself living in Dubai for the rest of my life? if not Dubai, then where? what's the point of everything I do? So many questions, not as many answers. Oh well, it'll pass. And I'll post those pics soon, I promise! After a long day of walking all around Portobello and Knitsbridge, we decided to take it easy the following day. But in the evening, we headed towards London's West End to catch a show. We booked tickets that same morning for Footloose...It sounded like a fun show, there were seats available, and it was one of the more affordable shows out there. I had never been to a musical before and had always wanted to see one, but I never got the chance to catch one in Montreal, or during my couple of visits to NYC. 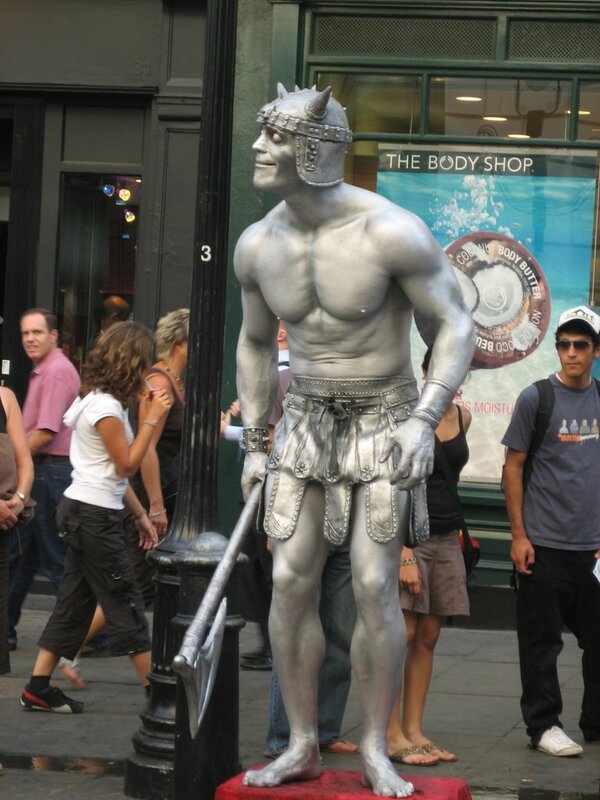 Before the show, we walked around Covent Garden, which is filled with street performers. We then headed over to the Novello, which is where our show was playing. 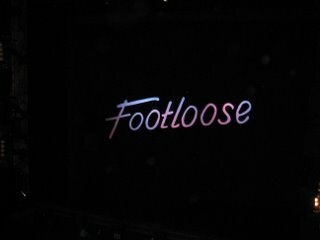 The show was fun, the dancers were great and the music was good (believe it or not, I have never seen the movie). After the show, we walked across Waterloo bridge, and admired a magnificent view of London by night (my night-time pictures did not come out so good unfortunately). 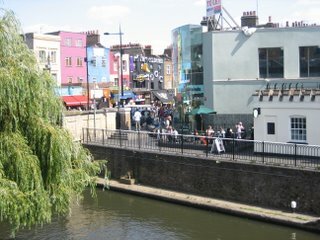 The following day, we hit Camden Town, which I loved! There were some very funky shops and restaurants there, very different to anything else I had seen so far. 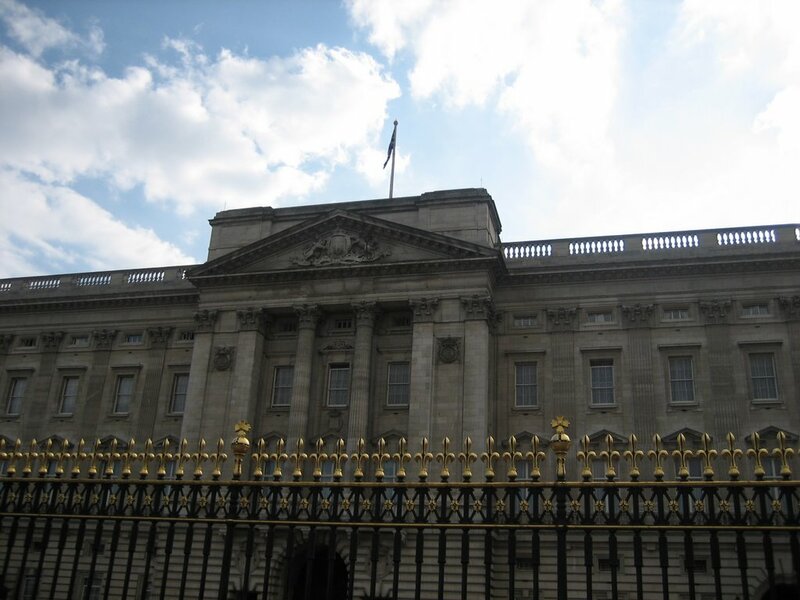 Our next stop was Buckingham palace. 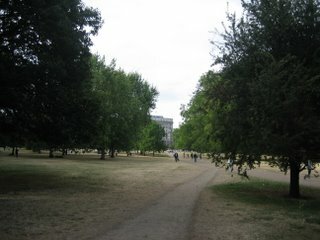 We walked through Green Park first, which was very nice, but not so green. After the recent heat wave London had experienced, the grass turned yellow in all of London's parks. At Buckingham, we didn't get to experience the changing of the guard...and to be quite honest, I was imagining the palace to be much bigger than it really is... But I have no doubt that the Queen's country cribs are much more spacious than her city digs. More London pics tomorrow...time for bed now...I should really start writing my posts earlier than midnight!!! I had only been to London once before, and it was only for 12 hours, between two flights, so it doesn't really count. This time, I tried to make the most out of it and walked around all over the place....and I must admit, London is one cool city. 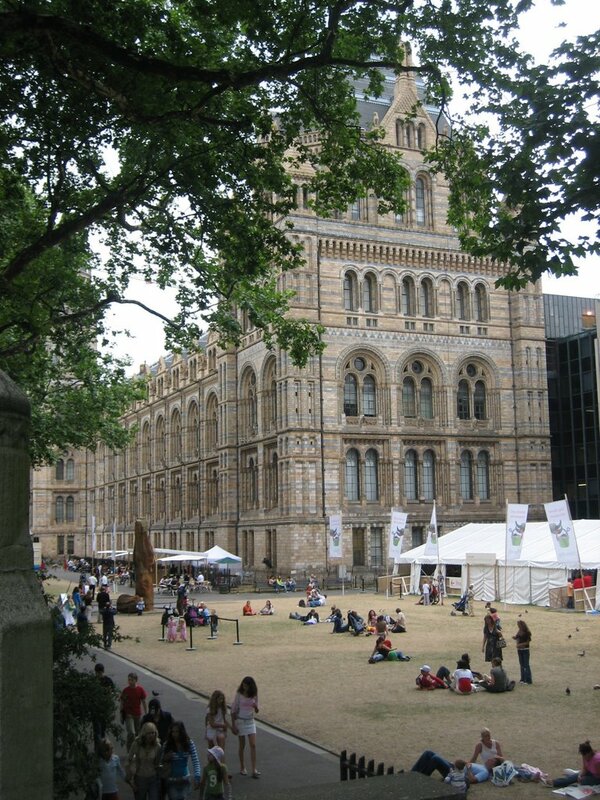 The architecture is great, the people are nice, the shops are amazing, and there's so much to see and so much to do! I did enough walking there to last me a lifetime...or at least until my next trip! I got the hang of the tube system a couple of days after I got there, and I was amazed that you could really get to practically anywhere in London without having to get into a car. The underground system is much more sophisticated than the Montreal one, which only had 4 lines that barely cover a quarter of the city. And so punctual too! The weather was...typical London weather most of the time. The first day was sunny and warm, but after that, we mostly got partly cloudy days, some rain, and temperatures in the low 20's. 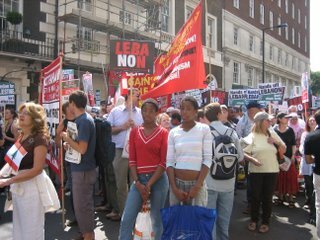 The first day I got there, we participated in a huge peace demonstration...It was incredible: tens of thousands of people were there, and it was really heart-warming to see all these people, from all walks of life, coming together to voice their opposition to the pointless and destructive war in Lebanon, and to Blair's foreign policy. 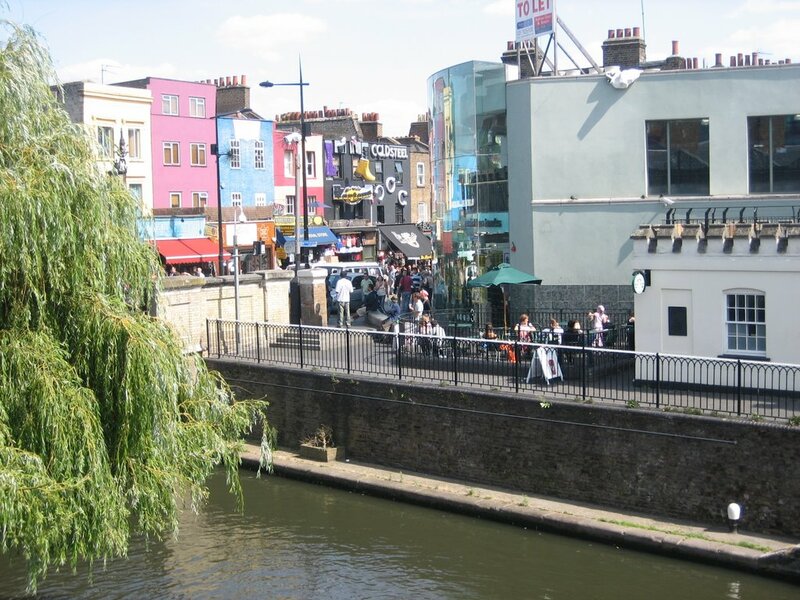 A couple of days later, we went walking around Portobello market and Notting Hill. Unfortunately, I didn't get to experience Portobello on a weekend, which means that a lot of the antiques shops were closed. 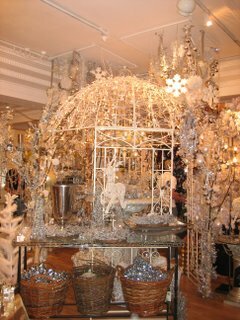 We then took the bus to Knightsbridge, which is where Harrod's is. It was packed with tourists, but we still decided to walk around and check it out. It's big. And it has lots of cool stuff in it. And it's very expensive. All I bought there was a bottle of water, and that alone cost me 2.5 pounds (17 Dhs)!!! 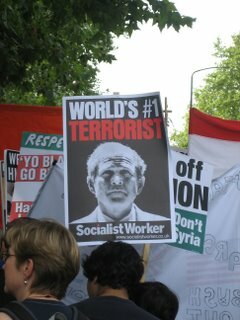 In one section, there was some Arabic music playing in the background....I think it was Amr Diab! Those are Dubai Properties flags on Harrod's. 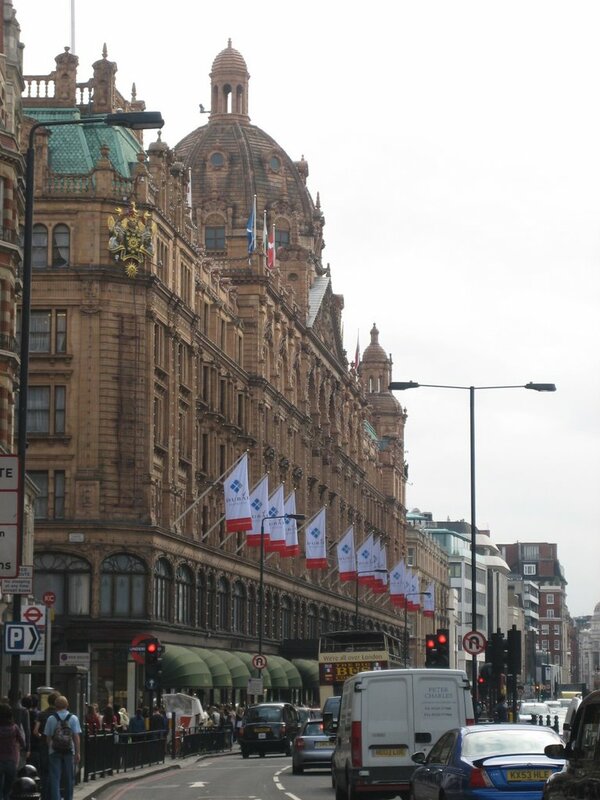 Dubai Properties is apparently selling properties in Harrod's! 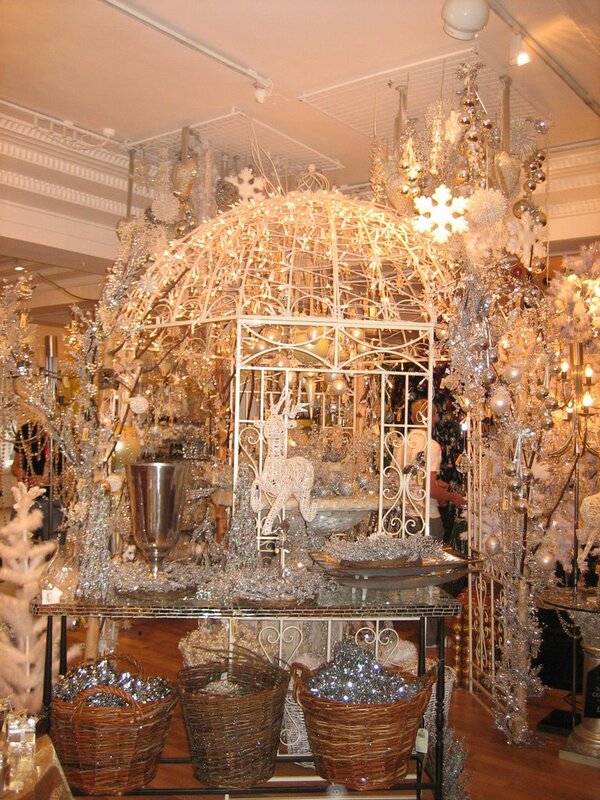 There's even a year-round Christmas decorations section! Playing Christmas carols! Since I started blogging, I've never gone without posting for so long! But it was a much needed break from everything: Dubai, work, blogging, traffic, the heat and humidity and the sheer boredom of UAE summers. 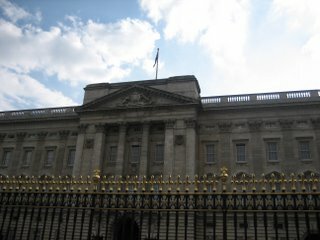 I just got back from a weeklong trip to London, which was loads of fun. I'll write more about the trip in my next posts, I promise. Right now, I need to recover from a sort of hellish trip back, which saw me spend 6 hours in Heathrow airport before the plane even took off. It was absolute madness, I've never seen so many people waiting in such long lines in an airport. It took 2 hours for me to be able to make it through security alone! And all I was allowed to take on board was a plastic bag with my wallet, keys, passport and boarding card. But I was so happy to finally make it on the plane, nothing else mattered. Reading glasses are allowed, but not their cases. Contact lens containers are allowed, but no contact lens solution. Tissue packs are allowed, but without the plastic wrapping around them. No phone, no book, no magazine, no newspaper, no iPod, no laptop, no make-up, no perfume, no cream, no toothpaste, no water....nothing! Flights were delayed, that was a given. Mine was delayed for 3 hours. But I was impressed that no one seemed to be losing their temper, no one got upset. People just went with the flow and made the best out of the situation. I don't know how long this situation will last, but if security measures are going to remain this tough, then airport authorities are going to have to find a way to streamline the process because they can't let this mess reign for too long. Oh well... At least I didn't get a call about the free TV I've been enjoying so far...at least not yet! Don't know if I'll be blogging much during the next week or so...if not, I promise plenty of pictures upon my return. A friend sent me this video and this website. 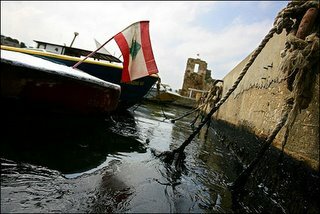 It lists a bunch of non-profit organizations that are involved in giving aid to Lebanon. Check it out. Put your name on the flag. And forward to anyone you know.